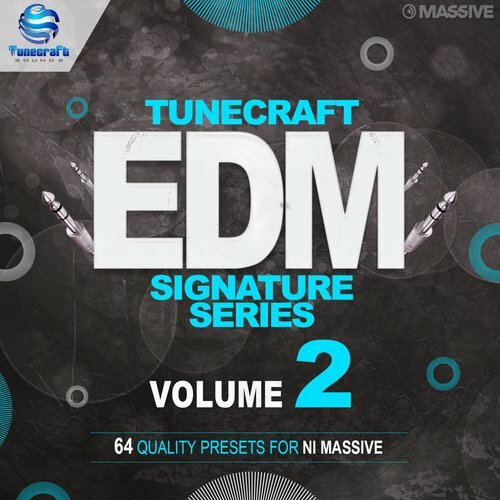 Tunecraft EDM Signature Series Vol. 2 is a continuation of this must have series from Tunecraft Sounds! Whether you’re into dubstep, glitch hop, electro house, nu disco, drum & bass or any other sub genre, sound design is now an essential aspect of your production! Of course, you can’t just rely on your synth work, but choosing the right presets is off to a good start: The good news is, we got what you need! Inspiration has come from biggest artists such as Skrillex, Deadmau5, Madeon, Knife Party, Daft Punk, Kill The Noise, Pegboard Nerds, Koan Sound, Noisia, Lets Be Friends, Zomboy, Mord Fustang and a lot more. Each patch comes mapped with macros assigned to allow a quick control of the essential aspects of your sound, and offer countless possibilities of tweaking. Perfect for pro users who needs high quality sounds, as well as for the beginner who needs the most usable sounds to make any track sound like the pro’s. It’s also great for educational purposes teaching users how to design their own synths while getting the most out of Massive. What you need is just Massive 1.3 or higher and a few automation tweaking ! Bonus 1: Dig in the ableton live 8 demo project and check how we edited the midis, how we automated Massive parameters, or how we set devices to get that crispy sound ! No external plugins needed, just Massive, a bunch of EQs and compressors to ensure the sounds blend well together, and that’s it ! Bonus 2: Not an ableton user ? no problem ! We also added all the midi clips to recreate any sound or melody from the demo, and create your own tracks from scratch ! Please note that drum sounds are taken from various Tunecraft products and therefore are NOT included in this pack. So whether you want ready made presets to slot straight in to your work with no fuss, or want to get deeper into designing your own unique sounds, this pack is a must to bring back to your lab, fire up your equipment and create your next level tune!